This Peach Tart is the perfect combination of buttery crisp pastry and sweet peaches. The peaches are not peeled for this rustic free form tart, which makes this dessert much easier to make then a peach pie or even a peach cobbler. All you need to do is to wash the peaches, cut them into thick wedges, toss with a little sugar, and place them on a platform of pastry. This tart looks so good when pulled from the oven, with its pastry all brown and crisp, and the peaches are wonderfully soft with lightly caramelized edges. Excellent served warm with a small scoop of vanilla or caramel ice cream. The pastry used for this peach tart is Pate Brisee, pronounced 'paht bree-ZAY' which is a French short crust pastry dough made from a mixture of flour, a little sugar, salt, butter, and ice water. It has a high ratio of fat to flour which gives the pastry its crisp and crumbly texture and buttery flavor. It is the perfect backdrop for fresh peaches. Peaches are the focus of this tart, so we need to talk about this lovely fruit. There are two types of peaches, 'Clingstone' and 'Freestone', with many varieties within each classification. The names (Clingstone and Freestone) refer to how easily the flesh of the peach separates from its stone. The Clingstone (available in late spring/early summer), is exactly that, the flesh clings stubbornly to the central stone or pit. Freestones (available late summer) have a flesh that is easily separated from the stone. For this tart I prefer the Freestone variety (either white or yellow flesh), which makes cutting the peach into slices very easy. I do not peel the peaches as I think the skin looks nice and adds both texture and flavor. When buying peaches, smell and feel each peach. The peaches should smell of peaches and feel firm, yet have a slight give when you press gently on its shoulders. Make sure there are no bruises, cuts, or soft patches on the peaches. To read more on peaches click here. Pie Crust: In a food processor, place the flour, salt, and sugar and process until combined. Add the butter and process until the mixture resembles coarse meal (about 15 seconds). Pour about 1/8 cup (30 ml) water in a slow, steady stream through the feed tube until the pastry just holds together when pinched. Add the remaining water, a little at a time, if necessary. Place the pastry on your counter, gather it into a ball, cover with plastic wrap, and refrigerate for about one hour to chill the butter and allow the gluten in the flour to relax. Once the pastry has chilled, remove from refrigerator and place on a lightly floured surface. Roll the pastry into a 13 inch (33 cm) round. To prevent the pastry from sticking to the counter and to ensure uniform thickness, keep lifting up and turning the pastry a quarter turn as you roll (always roll from the center of the pastry outwards to get uniform thickness). Transfer the pastry to a parchment paper lined baking sheet. Cover and place in the refrigerator while you prepare the peaches. Preheat your oven to 425 degrees F (220 degrees C). Peach Filling: Wash and, if needed, rub the peaches to remove any fuzz. Cut the peaches in half, remove the pits, and cut into thick 1 inch (2.5 cm) wedges (slices). Place the peach slices in a large bowl and season with the salt. Then add the sugar and gently toss to combine. Arrange the peach slices on the pastry, placing them as close together as you can, without overlapping the slices too much. Leave about a two inch (5 cm) wide outside border. Scrape any remaining sugar from the bowl and drizzle over top of the peaches. 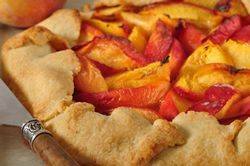 Gently fold the edges of the pastry up and over the peaches, pleating as necessary. Make sure to seal any cracks in the pastry. Bake in your preheated oven for about 35 - 40 minutes or until the pastry is golden brown and the peaches are tender when gently pierced with a sharp knife. Remove from oven and place on a wire rack to cool. Serve warm or at room temperature. Very nice with vanilla or caramel ice cream. Cover and store any leftovers in the refrigerator.